"But you have to give credit to them, they took their opportunities". Like Japan will need to be at the World Cup, Scotland had to be smarter, more creative and faster - and in the first half it looked like they were well on their way. Ireland were 12-3 ahead thanks to tries from Conor Murray and Jacob Stockdale when Sexton picked up a nasty injury. "We are frustrated and disappointed". Scotland captain Greig Laidlaw admitted their second-half errors cost them the game, saying, "We released the pressure valve". It's not anger, it's 'Why did we have such a good first half and then we didn't play the same way in the second? 'With the tackles, carries and contact work at a very high level, you can't keep that up for 80 minutes. "We restricted them to an intercept try and it was a massive defensive effort". 'Just that final piece, the execution off our set-piece, which has been really good, that fell off the jigsaw today and that's my fault. "I think we just muscled our way through it". Ireland just took a grip of that game, raised the stakes. 'There was one in particular. "There was a lot of knock-ons and we gave away penalties in the second half". It should have been play-on. "We'll have to rely on other people which isn't where you want to be". The Scots appeared to have pushed the Irish back in midfield and the ball went loose, but Carbery picked up and slipped through a gap as Allan dell and replacement Rob Harley missed a double tackle. 'It was a big call in my eyes. The win sees Ireland move to fourth in the Six Nations standings, before travelling to face Italy in two weeks. The talismanic full-back trudged off in the first half of Saturday's match nursing a shoulder injury. 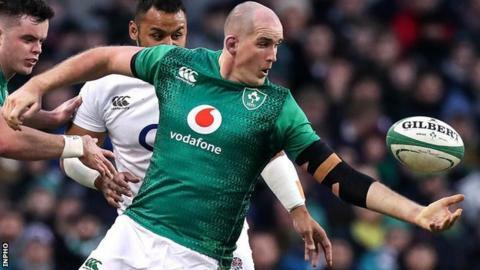 "He's very sore", said Scotland coach Gregor Townsend. We could've scored a couple more tries. "He's a great player and he's got the mental strength to back it up".